Macy Gray reimagines some old work, provides some new work, and tackles other artists' work in an exciting, triumphant new LP. Now, this is what Macy Gray was supposed to be doing all along. Stripped, her triumphant first LP for Chesky Records, is like putting a needle down on wax, hearing sounds echo through speakers and simultaneously seeing a lightbulb go off above your own head. Why did it take her this long to do a blues/jazz record? And why, oh why, hasn’t anyone ever thought to turn “She Ain’t Right for You” into a five-minute faux-reggae romp that would play as well in Miami as it would in Montreux? Backed by a stellar quartet featuring Ari Hoenig on drums, Daryl Johns on bass, Russell Malone on guitar, and Wallace Roney on trumpet, this set feels as raw as it does real, as organic as it does inspiring. It makes sense, considering how the entire thing was recorded over two days in a broken-down Brooklyn church, one microphone and no overdubs. It’s the kind of thing that just doesn’t happen all that much anymore in such a spineless, processed popular music lexicon that often rewards scientific formulas more than it does sincere soul. Yet what we have here is an artist proving that she has it all. Rhythm. Blues. Confidence. An inherent lack of fear that enables this kind of idea to even formulate, let alone take shape. In addition to reimagined versions of a handful of hits, there’s a pair of covers and three new songs, all of which thrust Gray into an entirely new hemisphere as a songwriter. “The Heart” is the best example of that. Eased in with electric guitar, it’s some of the most heart-wrenching stuff the singer has ever recorded. “I don’t need no glasses to see that you’re walking away from me,” she pleads before asserting, “You leave me, you must be crazy.” Musically tender, Gray knows how to pull emotional strings with her understated vocal presentation, and man, she can sell a line like “I really thought by now that you would miss me” like very few other people singing today. It’s a musical victory in real-life defeat. The same is said for the record’s opener and closer, respectfully, “Annabelle” and “Lucy”. Both doing wonders with the blues, the former crafts a threat to keep someone away between gorgeous guitar soloing from Malone. The proverbial cherry on top of it all is Gray’s backing players joining her for some lazy gang harmonies that give everything an invaluable intimacy. The latter then sees Gray go back to her sexually explicit roots with both success and fun as she offers up her Lucy, which rhymes with…well, she smartly allows the end of that phrase to float through smoke-filled air without any real resolution. Even better is when everything old becomes new again. “Sweet Baby” is re-imagined with Bo Diddley funk and cajun flair. Plus, Roney’s jazzy trumpet bridges the gap tastefully between halves in a way that allows him to both spread out and show off. “She Ain’t Right for You” follows that up with pop-reggae that is surprising, welcome, fun, and clever. Gray has always flirted with Rastafari influences (some early-day live versions of “I Try” are simply killer), but this is one of the first times she fully embraces Jamaican textures, and it pays large dividends. Other artists’ work shines, too. The headliner here, of course, is Metallica’s “Nothing Else Matters”, and the arrangement is so unrecognizable that nearly all the residue of the original is utterly forgotten. Based around slinky bass and guitar grooves, it’s nearly seven minutes of after-hours atmosphere all the while giving entire new meaning to each lyric that escapes the singer’s lips. Bob Marley’s “Redemption Song” then stays reasonably faithful to its initial incarnation while Gray adds a touch of sadness that only she could offer. 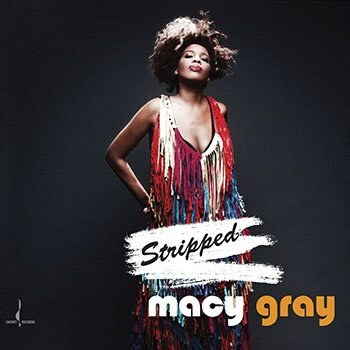 And at its core, Stripped is precisely that: something that only Macy Gray could offer. She became famous due to her unique voice and oversized personality, and what makes this set so intriguing is that even though those love-it-or-hate-it vocals remain prominent, everything surrounding them is downsized. It’s a great idea with impeccable execution that comes together in a way that feels just so cool. Which, of course, begs two questions: First, what took so long? And then, when, oh when, can we get around to hearing some of this stuff again?